Our DVR is a security-based TVI DVR (Digital Video Recorder) that is used for monitoring and archiving security camera footage from one or more security cameras and has a separate input for each camera that is handled. There are three different models to choose from two series, three series, or six series, along with three different channel options four channels, eight channels, and sixteen channels. All of our HD-TVI DVR delivers HD-1080p Megapixel video and can communicate over a single coax up to 1500 feet. Many of our Megapixel cameras have a zoom lens that can be controlled from the DVR or desktop, laptop, phone, or tablet. Since the Rugged Vault Hybrid DVR can automatically sense between HD-TVI cameras and any legacy analog cameras you may already have, this DVR is ready to grow with you as you slowly replace the old camera with new Megapixel cameras. The Rugged Vault Hybrid DVR has a very easy to navigate Menu structure that is easy to grasp right away. You will find that it is straightforward to scroll through the many options for how and when to record – real-time or motion-based – and can even speed up the process of searching for events in your recorded footage, with Smart Search and Event Search features that can find the evidence you need in a matter of minutes. This great Hybrid DVR series has so many features; we literally cannot list them all here, but here is a couple. For example, there is a “Signal Booster” built into every channel that corrects weak or fuzzy signals. It also can give you Alarm Notifications on your Phone or Tablet (via our handy App), a Gigabit Ethernet Port, Two-Way Audio Communication, and many types of recording to choose from (External Sensor, Motion, Audio Detection, Text/POS, etc.). 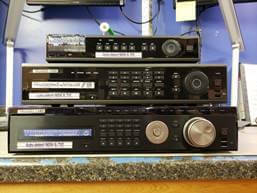 Our TVI DVRs have many options and features. Talk to one of our Sales Engineers here at RuggedCams toll-free at 866-301-2288 or stop by our website and check out the possibilities there. This entry was posted in Blog and tagged HD-TVI DVR.